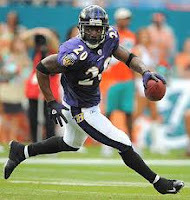 Advanced Football Analytics (formerly Advanced NFL Stats): What is Ed Reed's Going Value? What is Ed Reed's Going Value? Last year I looked at the salaries of free agent safeties to estimate the going rate based on production stats. 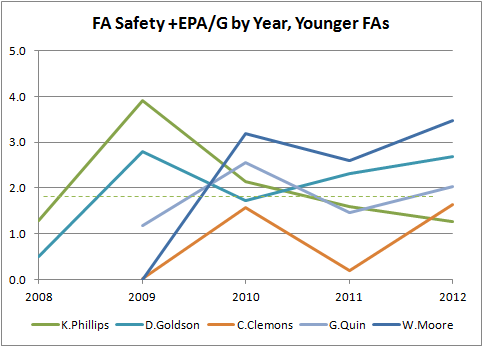 FA safety salary correlated fairly well with production, specifically +EPA (positive Expected Points Added). With Ed Reed, one of my favorite safeties, on the FA market at moment, I thought I'd take a look at what would be a fair market price for his services in 2013. Here, price is defined by salary cap hit. NFL salaries are notoriously complex with bonuses and guarantees. But these are boiled down into a single cap number, which is the cost to his team's overall salary cap, the most precious resource it has in acquiring and keeping players. The analysis here produced the chart below. In short, top FA safeties are valued at about $2.0 million for every +EPA per game, minus $170k. For example, for a guy who produces 2.1 EPA/G, his going rate would be about $4M per year. So where would Ed Reed stand in this context? The red line is a three-season moving average. The green dashed line is the production of the 32nd best safety in the league. This is intended as merely a benchmark for starting safeties and not as a replacement value or average value. Reed's recent performance is still worthy of a front-line starting safety. But based on his age, it's fair to say his performance is most likely on the decline. A fair estimate of his expected production would be close to 2012's level--about 35 points worth of total +EPA, and 2.4 +EPA/G. 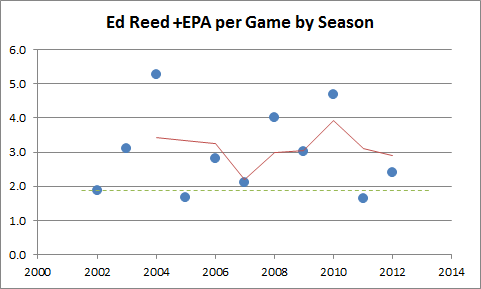 Based on the cap-hit/production market, Reed's value is something close to $2M * 2.4 EPA - $170k, or about $4.6M. But that's before taking into account injury risk. Yes, aging players are prone to miss more games than their younger counterparts, but players of all ages are prone to significant injury risk. The question becomes, what is the marginal injury risk for a 34 year old safety? It's difficult to quantify and a question worthy of a full study. So for now, let's simply say $4.6M is the ceiling for Reed's value, or perhaps that it's his injury risk-neutral value. That's nothing more than an estimate of his theoretical value, and not a statement about how much he should be paid or a prediction about how much he will be paid. The FA market for any position is not a buffet line of players in a liquid market, where teams can select any combination of price and performance they like. It's an auction market with a handful of FAs in supply and a few teams realistically in demand. There are also variables such as contract length and guarantee amounts which ultimately go into the equation. There are considerations like experience, leadership, and personal dependability that Reed offers his next employer. Still, this would be a useful benchmark for determining how much a team would be over- or under-paying for a FA. For example, in 2012 Reed made $7.2M in base salary, $1.07M in amortized signing bonus, and $1.3M in previously-exercised option bonuses for a total cap hit of $9.6M. Baltimore overpaid Reed by a factor of two. But that's deceiving. 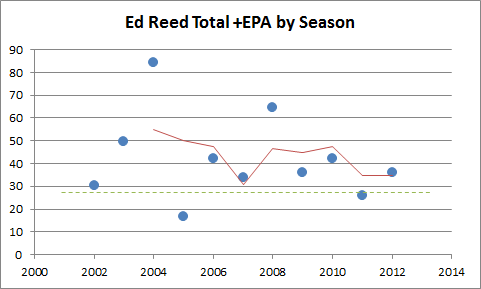 2012 was the last year of a 7-year deal which paid him an average of $5.7M per season--a small bargain for Reed's performance (~3.0 +EPA/G) over the life of the contract. What about the other FA safeties on the market? The blue chip FA was the Falcons' William Moore, who resigned with Atlanta to a 5-year, $32M-maximum deal. The first three years were reportedly worth $18M, which averages to $6M/yr. Moore's three-year average +EPA/G was 3.1 points/G, which translates into...wait for it...$6.0M/year according to our estimate. 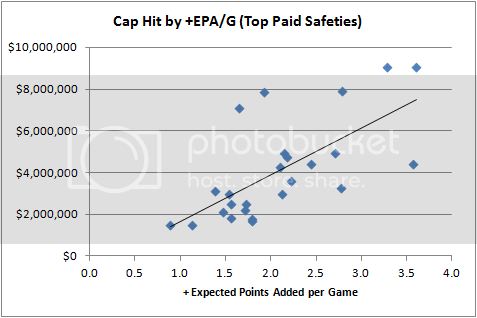 The two plots below track the per game +EPA of the other top FA safeties. 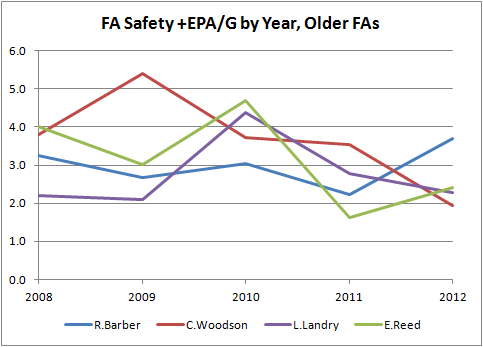 The first chart is for the over-the-hill gang--Woodson and Barber (both converted CBs), plus Reed. I included LaRon Landry on this chart because of his injury concerns and despite his relative youth. The second chart is for the younger guys. The chart for the younger guys provides a fairly clear picture of each player's recent average production level. The only exception is Kenny Phillips' 2009, in which he played in only two games. The recent +EPA/G trends of each player match qualitative rankings like those of Pro Football Focus. The only difference is that PFF has Phillips ranked ahead of Quin. Peter King's rankings of safety FAs match precisely. With Moore off the market, Dashon Goldson becomes the top guy. Since becoming an every-week starter four seasons ago, he's averaged 2.4 points/G of +EPA. That puts him in the neighborhood of $4.6M. A few last observations from the charts...Almost all the FAs improved in their contract year. Only two of the nine players declined--Woodson and Phillips. Not enough data for any kind of conclusion, but it is consistent with the theory that contract-year players put in extra effort. Also, the general trend of the older group is unmistakably downward, while the younger group is either generally steady or improving. You mention that it would be interesting to look at the likelihood of a player getting injured - are there any good data sets that include player injuries? I like this as a good starting point for FA evaluations. Like you mentioned, there are a lot of other factors though. One more to keep in mind is how a player would fit with a new team. For example; Nnamdi Asomugha. When he was with the raiders he was playing extremely well. I don't know what his EPA was, but I have to imagine it was pretty respectable. he get paid accordingly with his new contract in Philadelphia, but didn't play all that well when he got there. Did his game just fall off? Did he get the big money and lose motivation? I think it's a clear cut case of a player being able to succeed better in one system that another. I'm not suggesting that he is a system player, far from it, but i do think every man has a skill set which will make it easier for him to succeed in certain situations. Isn't that a part of a coach's job after all, recognizing your players strengths and putting them in a position to succeed.? Where I am the question being asked over and over, including by the people who have to make the decision, is "What is Revis worth?" In cap space and draft picks. I like the Texans, even if I am a Ravens fan. I just hope Texan fans know that Ed really can't tackle anyone at this point. Here is a Company that is going to pay you to brand their Name and Product. Your INC0ME is G U A R A N T E E D by CONTRACT. Even if you NEVER make a SALE or SP0NS0R anyone, You Still Get P A I D! Your income is guaranteed by contract. That's Right. If you never make a sale or sponsor anyone, YOU STILL GET PAID!